We have written extensively how the tax credit do or die with Covered California and health insurance in general now. But what income and whose? We've helped 1000's of people enroll with tax credits and the income piece is always the trickiest part. Lots of confusion and headaches. Let's erase that confusion and rather than the usual tax form bomb that you usually get, why don't we walk through each piece step by step. Of course, you can always call us at 800-320-6269 for specific income questions. As Certified Covered California agents, our services are 100% free to you. Let's get started. It can mean $1000's per year in tax credits. We're going to break down the income piece into three separate questions. This addresses 99% of the questions we come across. First, why even ask the questions? Income is the primary driver of tax credit now. It's on a sliding scale so as your income goes down, your tax credit should go up. You may also get richer benefits for the same price as the normal plan as income hits certain thresholds. This can be a huge deal especially with the Silver 87 and 94. 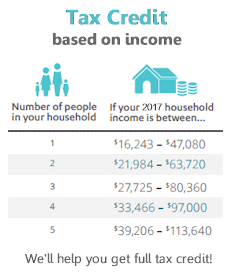 Here are the main income levels by size of household (we'll discuss this in the "Who" section below). The tax credit itself is called an Advanced tax credit which means you get the money monthly (no waiting for April). Why be as accurate as possible? That's our goal with everyone we help. 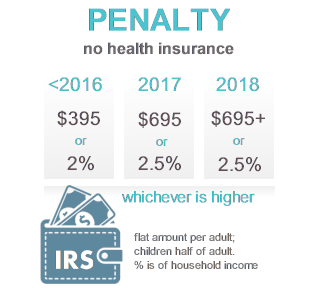 If your income is higher than we submitted to Covered Ca, you may have to pay back part or all of the tax credit in April the following year. Conversely, if your income is lower, you're not getting the full monthly tax credit that you should be getting. You may also be missing the Enhanced Silver benefits. What if income changes or if we won't know the estimate until later in the year (very common...think retail self-employed)? We can always adjust the yearly income estimate during the year. In fact, as Certified Covered Ca agents, you can just email us the update (as with any other updates) and we'll handle it on this side. Just call us at 800-320-6269 for this free service. The system can be a bit squirrelly so let us help with this piece. Again, the goal is maximizing tax credit and avoiding surprises. Alright, let's jump into the big questions on income. You can always run your Covered Ca quote here with tax credit calculation to test different income levels. So whose income do we look at? 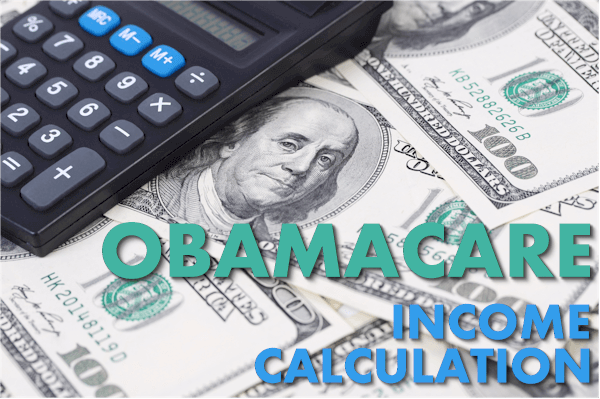 Whose Income for Obamacare Calculation? Covered Ca throws around "Household" a lot in the discussion. The easiest answer is that their definition of household is everyone that files together on one 1040 tax form. One note...married couples must file Jointly to get the tax credit. We have many enrollees that claim grandmothers, grandson, you name it. That's fine as long as you claim them on your 1040 tax form as a dependent, they are part of the household. Even if they live somewhere else. Net net...the 1040 tax form is king in determining whose income to include in our total. What about households in transition. Let's say you're getting married in June (congratulations!). You would then treat household according to how you expect to file the following April. In this case, you would file married jointly (if jointly) and therefore you estimate your income based on the married couple. This is true even if you start the year single. The same is true for divorce, baby additions, older dependents planning to file their own taxes, etc. Think "How many people will file together next April?". If you have older dependents (children or otherwise), we would include their income as well. Of course, we're happy to help you analyze this piece at 800-320-6269. 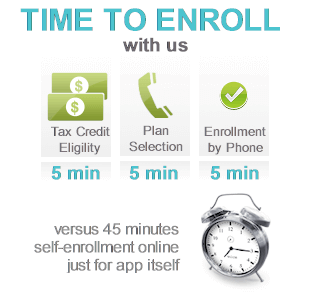 We generally save people about 45 minutes to 1 hour in the process of tax credit calculation and enrollment. Not kidding (unfortunately). We also make sure you get the correct amount and our services are free. Okay, so that's the who. Let's talk about the "When". What Period of Time for Obamacare Income Calculation? The "When" can be confusing as well. We want to estimate the income for the current year. Essentially, what we plan to show on next April's tax return. For example, if we're February of 2017, we would want to estimate what will show on our tax return in April of 2018 (for the 2017 year). This is inherently tricky for many people. Still better, self-employed, retail, with 50% of revenue based on Holiday traffic. For many people, it's really hard to estimate that far out in terms of income. We can always adjust the income estimate during the year as we get better info. In fact, we make it easy! Rather than fight the system (careful, it can cancel coverage if not done correctly), just email us the updated income estimate and we'll correct on this side. Our services are free so take advantage. If our income really changes year to year, try to be conservative. I'll explain the ramifications of our income being way off. Each tax filing, we'll receive a 1095 form from Covered Ca. It will basically spell out our received tax credit. When we file taxes, the IRS compares what we received versus what we should have received. This isn't too bad but not ideal. You don't lose the tax credit if we overshoot our income estimate. You'll recoup it at tax time. It's probably better on cash flow to have the tax credit monthly but hey, we'll get it at tax time. The down side is that we might have been eligible for the Enhanced Silver benefits. 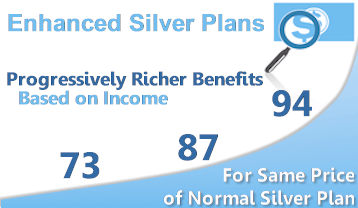 This can mean much richer benefits for the same price of the normal Silver plan. Much Richer for the Silver 87 and 94! We don't want to lose out on that so let's get the best estimate. One other note, there's a threshold below which we are eligible for Medi-cal. For a single person, it's right around $17K. What if you estimate $18K but end up at $14K (medi-cal area). Officially, there's a $300 penalty for this situation but we haven't seen the IRS actually apply it. That makes sense since it's so hard to estimate a full year out and you're basically kicking people when they're down (income at poverty level and lower than expected). Just know there is a penalty out there...hopefully they continue to continue with current, rational approach (and forget about it). Let's say we estimated $20K and actually made $35K at tax time. Many things can cause this. Let's say we received tax credits of $3000 for the year but were eligible for $2000 based on higher income. Bam! You'll have to pay back a percentage of the $1000 extra tax credit and if your income goes over the cap ($47K for individual), you'll have to pay it all back! You won't have to pay back the Enhanced Silver benefits if those were used. Let's get the estimate right. Let's avoid any April surprises. 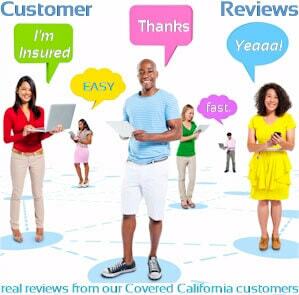 Call us at 1800-320-6269 or run your Covered Ca quote here. Our services as Certified Covered Ca agents are free to you. Now....on to the real reason we're all here. What income? Here's the part that usually causes the most trouble. Here's the short cut answer. Look at line 37 on the 1040 tax form for the income to consider. This is the Adjusted Gross Income and it's where we want to focus. There are a few items to add to this but they're more rare. Again, last year's line 37 is only a guide. We actually want to estimate what line 37 will be next April. Let's break it down into the two key groupings (W2 or self-employment) and then we'll look at the other less-common sources of income. This is normal income you get from a paycheck. It comes via the w2 form from your employer. It does not include 1099 contract work which is essentially self-employed in the eyes of the IRS. So what do we use from the w2? We need to look at Gross income. This is what Covered Ca will consider. If you have multiple W2's, try to estimate what the total will be for the year. Again, line 37 on the next 1040 tax form. W2 is pretty straight forward. Of course, we can help with any questions at 800-320-6269. Our services are free to you as Certified Covered Ca agents. This gets trickier. Of course. Again, if your income doesn't change much from year to year, the prior 1040 form will be a good indicator. Otherwise, we need to estimate out what our NET self-employment income will be. We'll talk about the deductions later on but these are the three that are common for self-employed. Estimating can be tough for self-employed people. Go with your best estimate and if it really bounces around, there are two options. It's actually called an Advanced Tax Credit. This means you get the tax credit now! It's deducted monthly from your premium amount and everything settles up the following April. 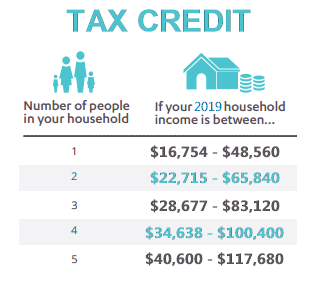 If your income comes in lower, you'll get the extra tax credit you were eligible for in April. The opposite is also true (and not a fun surprise). 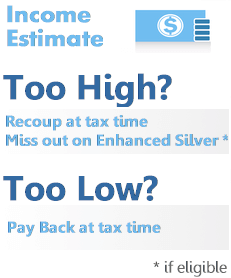 Keep in mind that you may be missing out on the Enhanced Silver plans if you go more conservative. Important note: For self-employed people, there are deductions in line 23-35 of the 1040 that help. The two most common are health insurance premium (for you and dependents) and 1/2 of the self-employment tax. This should all figure into the 1040 but make sure to include it in your estimate! Let's look at the one-offs that come up frequently once we have the w2 and self-employment income figured out. Again, almost all these items should figure into the line 37 (except for tax-free interest, Social Security, and foreign income). If you take Social Security early, we need to include it in our incomes estimate. This will usually be in addition to your line 37. Social Security disability is generally not included. Unemployment income is included in our Estimate. Try to estimate your annual expected income if it's going to end. We would include disability income if it ended unemployment. You'll see this above line 37 but just in case, use your net rental income (after costs associated with this revenue stream). This item might be worth a quick check with your accountant since there are so many different situations. The net net is this...is the disbursement subject to tax? If so, we include it. Spending down assets (bank accounts, retirement accounts, etc) are generally not taxed and do not figure into our calculation. Here are the main deductions to consider. Make sure to look at prior year's 1040 for line 23-35. Make sure to take advantage of these when estimating income. Only look at the current year in question. For example (Jan - Dec 2015 to show on April 2016 tax return). If tax forms are not your cup of tea (we'd be worried if the were), we can help you. In about 5 minutes, we can quickly size up your estimate, calculate your full tax credit, and compare the health plans. It's fast, easy, and free to you since we're Covered Ca Certified Agents. Call us at 800-320-6269 and we can go through any questions or run your instant Quote including tax credit from income estimate here. Thanks!